Description: In breeding plumage adult guillemots have black or brown upperparts, head and neck and white underparts. They have white tips on their wings and they flanks are streaked with black. They have long black bills, with an orange gape, dark brown eyes and black or reddish feet and legs. Outside of breeding plumage guillemots are duller and their chin, throat and neck are white and their bills and legs are lighter. They have a thin black stripe running behind the eye. Juvenile guillemots look similar to non-breeding adults but the stripe behind the eye is white and they have a white eye-ring. Nesting: Guillemots nest in large colonies on cliff ledges or flat rocky islands. They lay their eggs on bare rock. Guillemots lay a single egg which is camouflaged and conical shaped so it doesn’t roll off the cliff edge. It is incubated by both male and female in turn for 30-32 days. Both parents feed the chick for 3 weeks until it fledges and jumps into the sea. The male then continues to feed it until it is able to fly. Feeding: Guillemots eat fish, crustaceans, worms and fish eggs. 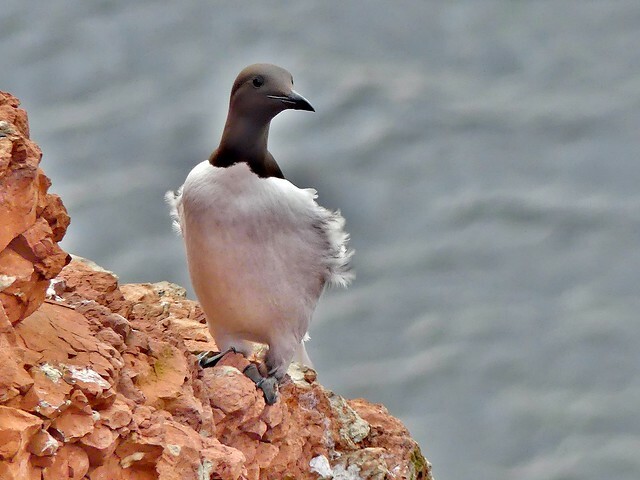 Where to see them: Guillemots can be seen around the UK coastline but are most widely found on the cliffs or Scotland and north east England. Bempton Cliffs has huge colonies of guillemots. During winter they live mainly offshore. Did you know? Guillemots are also known as ‘murres’ due to the deep murmuring noises made by the colonies of nesting birds.